Crist Hernandez was selling mango slices and fruit punch at a corner of Mount Pleasant’s main artery on a recent Sunday, just as he’s done every weekend for two decades. 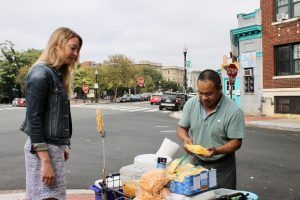 Hernandez’s pop-up stand on Mount Pleasant Street Northwest has catered to the area’s evolving population over the years — first, an overwhelmingly Latino community and then a mix of long-time residents and mostly white newcomers. Hernandez is one of many local business owners in Mount Pleasant and neighboring Columbia Heights that have strived to reach a new population as the segment of Northwest Washington, D.C., where they’ve operated for years, changes rapidly. The Thomas B. Fordham Institute, a conservative education policy think tank, in 2012 said parts of Columbia Heights and Mount Pleasant comprised one of the most quickly gentrifying parts of the United States. The percentage of white residents in the corresponding zip code grew by 26.9 percent from 2000 to 2016 — from 23.4 percent of the population to 50.3 percent of the population — census data show. Brianne Dornbush, executive director at District Bridges, said small businesses have to adapt to the new community demographics to succeed. 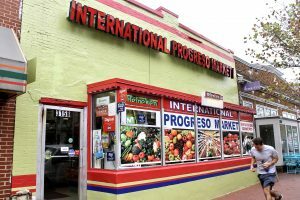 District Bridges is a nonprofit that seeks to promote economic development and community engagement in the Columbia Heights, Mount Pleasant and Lower Georgia Avenue neighborhoods. Adapting to the changing community could mean beginning to accept credit cards, Dornbush said. 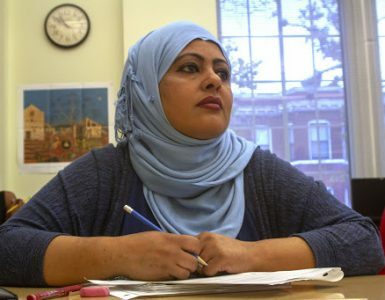 Although many immigrant-owned businesses primarily use cash, she said newcomers won’t patronize those shops if they don’t carry cash in their wallets. Businesses should also consider rearranging their front window displays to make them more appealing to native U.S. residents, Dornbush said. She said the businesses that survive are the ones that don’t seek to do business the same way they did 20 years ago. 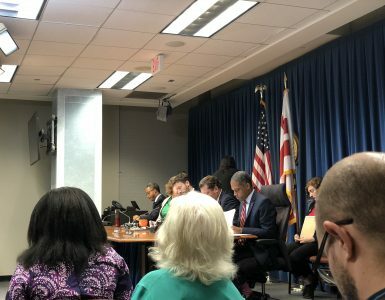 Through the annual Columbia Heights Day Festival, a Christmas tree lighting, community meetups and other events, Dornbush said District Bridges seeks to help old and new members of the community understand each other’s desires and needs. District Bridges also offers seminars and helps businesses apply for grants. Despite these resources, Dornbush said businesses’ survival depends on whether they try to build relationships with community members and cater to their needs. Businesses don’t inherently deserve to survive long-term, she said. DC USA, the district’s largest retail complex, opened in the heart of Columbia Heights in 2008 as part of an attempt to “revitalize” the neighborhood, the shopping center says on its website. The $145 million complex, anchored by a Target, encapsulates efforts to make Columbia Heights attractive to a new crowd. A continuing influx of big-box retailers, upscale stores and a higher-income population have put pressure on many small, immigrant-owned businesses. “The area was declining, and once DC USA was built, the business facilities were outdated. They were not attractive,” said Tom Dawes, business development director at Development Corporation of Columbia Heights. 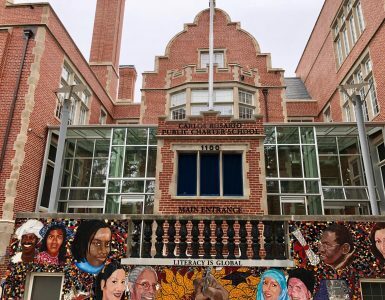 Dawes said his organization, a real-estate development nonprofit founded after the Columbia Heights riots of 1968, led a facade improvement project in 2010 for the 1400 block of Park Road Northwest. The program funded improvements to the exteriors of 10 small businesses to help them better compete against the area’s newer businesses, Dawes said. Los Hermanos, a Dominican restaurant, and Pho 14, which serves Vietnamese food, were among the restaurants, convenience stores, clothing stores and barber shops that Dawes said benefited from the program. The area is thriving as a result of the facade improvements, Dawes said. He said although some small businesses went under, most were able to hang on by adapting to the neighborhoods’ new population. “When restaurants have been around 10, 15, 20 years, they understand how to survive,” Dawes said. Still, there remains some tension between the area’s old and new communities. 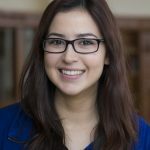 Camila Salvador, immigrant engagement coordinator at Central American Resource Center in Columbia Heights, said many white-collar newcomers barely contribute financially to the neighborhoods. They primarily work downtown, she said, and take the Metro in and out while patronizing one or two local bars. “That was really sad because that store has been there since before I was born and was really a staple and a part of the neighborhood,” Salvador said. She said some chain stores have responded to local outcry by seeking other locations. When CVS considered expanding into Mount Pleasant this year and replacing a mom-and-pop supermarket, people were “up in arms,” Salvador said. More than 2,500 people signed an online petition opposing the store. CVS responded by acknowledging the community’s concerns and deciding not to open its planned location, Salvador said. 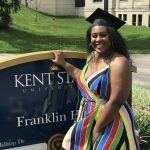 Aware of the neighborhoods’ history, some young professionals who are new to the area intentionally try to truly integrate into the community. Maddie Larken and Danny Villars are recent transplants from Arlington, Virginia, who have lived near Mount Pleasant for four months. They said it’s important for new residents to actively participate in the local economy. “If we’re eating out, it’s almost always in the neighborhood, usually on 18th Street or in Mount Pleasant,” Villars said while he waited to buy a bag of $3 sliced mangos from Hernandez’s stand. Villars and Larken said they moved to the Columbia Heights area “in pursuit of character” and encourage visiting friends to shop and eat at independent, established businesses. Larken and Villars said although they are a part of the surge of young professionals changing the neighborhood, they hope to help maintain the vibrancy that led them to the community in the first place. “I don’t know what the solution to gentrification is, but we’re doing our best not to (gentrify), if possible,” Larken said. 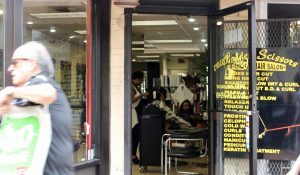 Rosabel Arbaiza, who owns the Golden Scissors hair salon and barber shop, said her business has done better since the community gentrified. As the neighborhoods’ overall population increases, she said people of various cultures visit her shop in Mount Pleasant for moderately-priced haircuts. “It’s gotten better because the community grows so much,” Arbaiza said in between customers on a recent Sunday. For Ali Arshad, who has sold flowers in Mount Pleasant for 22 years, business hasn’t changed much. He said his stand gets more attention there than it did when he kept it downtown, and he has loyal customers who come back to buy from him time and again. The customers who keep alive small businesses like Arbaiza’s and Arshad’s have figured out what Dornbush said is a highlight of the area. I’m a journalist and current graduate student at American University. 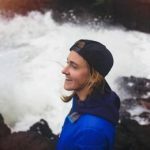 As a freelancer, I wrote for SheExplores on sexual assault in mountain towns and Rock and Ice on eating disorders among adventure athletes. Other publications include Seattle Met, MisAdventures, and Distinctly Montana. I was also an editorial intern at Seattle Met.